Dr. David Lee utilizes his Restorative Foot Surgery™ techniques to obtain unparalleled results for all toe surgeries. No unsightly scars and no excessive shortening! The most common digital deformities are hammertoes, claw toes, mallet toes, bone spurs, overlapping and underlapping toes, and curled toes. These deformities may or may not be painful. Corns and calluses - a buildup of skin on the affected joint, often associated with bursitis (inflammation of small pouches, called bursas, which lie above the joint between the tendon and skin) - are perhaps the most noticeable and bothersome symptoms. If deformities are left untreated, the toe's mobility may become limited, and more serious problems, such as skin ulceration and infection, may develop. 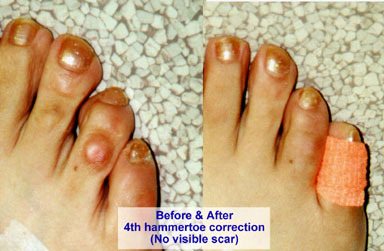 A hammertoe may be flexible or rigid, and may occur on any of the lesser toes. Ligaments and tendons that have tightened cause the toe's joints to buckle, cocking the toe upward. Shoes then rub on the prominent portion of the toe, leading to inflammation or bursitis. Corns and calluses soon form. During the early stages, a hammertoe remains flexible, meaning it will straighten when pressure is applied to the buckled area. As time passes, the toe can become permanently buckled or rigid, requiring surgery for correction. Painful calluses on the bottom of the foot may accompany rigid hammertoes because of pressure generated on the joint. Mallet toes and clew toes are similar in appearance to hammertoes, but joints at different locations on the toe are affected. The joint at the end of the toe buckles in a mallet toe, while a claw toe involves abnormal positions of all three joints of the toe. A bone spur is an overgrowth of bone that may occur alone or along with a hammertoe. Pain, corns and calluses are the major symptoms. Left untreated, a bone spur may eventually be accompanied by bursitis or small skin ulceration. Any one of the toes can overlap or underlap, pushing on adjacent toes and causing irritation. Overlapping or underlapping of the fifth toe is a common congenital problem that is easily corrected in children. Bunions can cause the second toe to overlap in adults. Pain, inflammation and small corns or areas of built up tissue may result. This deformity also can interfere with the normal function of the foot, and if left untreated, may lead to enlargement of bone or bone spur formation. Any toe problems that cause pain or discomfort while walking should be given prompt attention by a podiatric surgeon. Ignoring the symptoms can aggravate the condition, and over time may lead to an infection, a breakdown of tissue or ulceration. For people with poor circulation or an underlying medical problem, loss of the toe is possible. Recommended treatments will vary depending upon the severity of the condition. Trimming or padding corns and calluses. Wearing supportive orthotics (individually fitted plastic or leather inserts) in shoes. This helps relieve pressure on toe deformities and allows the toes and major joints of the foot to function more appropriately. Splints or small straps to realign the toe. Wearing shoes with a wider toe box. In certain cases, anti-inflammatory medications may be injected to relieve pain and inflammation. Medications have proven to be successful in relieving the discomfort associated with bursitis. Unfortunately, conservative treatments provide only temporary relief of symptoms - they do not correct the deformity. When the deformity is unsightly, painful or permanent, surgical correction is recommended to relieve pain, correct the problem and provide a stable, functional, aesthetic toe. Some of the most common surgical procedures are described below. Depending on health status, surgery may be conducted on an outpatient basis at the surgeon's office. The procedures are usually comfortably performed under local anesthesia or with intravenous sedatives administered by trained anesthesia personnel. To correct a deformed toe some bone and cartilage is removed to correct the deformity. A small portion of bone is removed at the joint, eliminating pressure on the toe, relieving pain and straightening the digit. Typically, Dr. Lee uses a silastic implant or similar spacer to replace the joint. This prevents floppiness of the toe (a common adverse reaction to surgery years after the surgery) and also prevents long term shortening of the toe. Multiple digits can be operated on simultaneously in certain cases. Fusion of the toe is most often used to correct toe fractures or, like Dr. Lee's implant arthroplasty, to increase the stability of the toe after arthroplasty. After the bone ends are removed, they are positioned together and compressed so that the bones unite. Fusions may be stabilized with a stainless steel pin , screw or absorbable pin as the bone heals. Care must be taken to avoid any impact that would damage or break the pin after surgery. Pins typically remain in place for approximately five to eight weeks unless they are the dissolvable type. Some swelling, stiffness and limited mobility can be expected following surgery, sometimes for as long as eight to twelve weeks. Keeping the foot elevated above heart level and applying ice packs will help reduce swelling during the first few days after surgery. Many people can walk immediately afterward, although the podiatric surgeon may restrict any such activity for at least 24 hours. Wearing a splint or surgical shoe for the first two or three weeks after surgery is recommended. The shoe protects the foot and helps properly disperse body weight. Stitches, if present, must be kept dry until removal - generally seven to ten days following surgery. While these are some of the most commonly prescribed treatments for Digital Disorders, others may be used.